Under- and over nutrition as well as nutrition risk factors such as communicable and non-communicable diseases are a common and major cause of morbidity and mortality in correctional facilities. Consequently, medical nutrition therapy (MNT), a spectrum of nutrition services aimed at optimizing individual well-being, is being recognized as integral to the health of people who experience incarceration. However, there is a paucity of research that explores the delivery of MNT in correctional facilities. A scoping review combined with secondary analysis of qualitative data (field notes, in-depth stakeholder interviews) from a 2-year ethnographic study about food insecurity and incarceration was undertaken to gain insights about the delivery of corrections-based MNT in Canada. Thematic analysis of all documents was done using an interpretive framework. An understanding about MNT was developed within three themes: 1) specialized service provision in a unique environment; 2) challenges with the provision of MNT; and 3) consideration of corrections-based MNT alternatives. An incarcerated individual’s nutritional health was conceptualized as culminating from various factors that included dietary intake and health status, enabling environments, access to quality health services, and clinical nutrition services. Nutrition care practices, which range from health promotion to rehabilitation, are challenged by issues of access, visibility, adequacy, and environmental barriers. Their success is dependent on demand (e.g., ability of recipient to act) and factors that enable quality health and food services. Advancing corrections-based MNT will require policies that provide supportive food and health environments and creating sustainable services by integrating alternatives such as peer approaches and telehealth. Professional associations, government, researchers and other stakeholders can help to strengthen corrections-based MNT by fostering shifts in thinking about the role of health practitioners in these contexts, preparing future health professionals with the specialized skills needed to work in these environments, generating evidence that can best inform practice, and cultivating collaborations aimed at crime prevention, successful societal reintegration, and the reduction of recidivism. Compared to general populations, people who experience incarceration have poorer physical, mental, and social health, making them among one of the most marginalized populations [1–5]. Many incarcerated persons arrive at correctional facilities with histories of inadequate access to preventive care and health services for acute or chronic health problems. Malnutrition, that encompasses both under nutrition and over nutrition , is common and a major cause of morbidity and mortality both in correctional facilities of developed and less developed countries [3, 7]. It is well established that nutrition is a determinant of physical and mental health and well-being . Indicators of poor nutrition, such as high sodium intakes and dyslipidemia, and dietary risk factors such as substance use, infectious and chronic conditions are prevalent among incarcerated persons [3–7, 9–14]. Providing appropriate nutrition and food services as a form of duty of care has the potential to generate critical benefits including the prevention of communicable diseases that poses threats to community health, reducing risk of developing non-communicable health conditions and associated cost burdens, improving chronic condition management, reducing problematic and self-harm behaviors, and preventing recidivism [3, 9, 11, 14–16]. Food and nutrition services within correctional facilities of developed countries generally have two interdependent areas of delivery [17, 18]. The first, often referred as the administrative component, involves the development and implementation of standards, menu planning, food service staff training, budget control, and food policy standards, as well as systems that are foundational to institution activities. The second component involves medical nutrition therapy (MNT), a spectrum of nutrition-related diagnostic, therapy, and counseling services aimed at health and disease management . MNT is often delivered by a registered dietitian or nutrition professional who works as part of an interdisciplinary health team. Examples of tasks executed by a MNT practitioner would include nutrition assessment and care planning, collaborative goal setting, implementation and evaluation of an individual’s nutrition care plan, interprofessional nutrition education, and advocacy. While nutrition services are generally classified into these two components which are often managed separately, they are integrated in various ways such as in the planning of departmental resources (e.g., food, equipment, type of service delivery), service provision, and policies. Many investigations that focus on nutrition service delivery and incarceration are largely based on food services systems, particularly factors such as food adequacy and quality [20, 21]. However, investigations of corrections-based MNT have been limited, despite reports that there are significant challenges in practice (e.g., limited resources, working with individuals that have several co-morbidities) [3, 11, 15]. A deepened understanding of the relationships and contextual factors that impact MNT in correctional systems could provide information to improve food and nutrition programs, practices, and policies which, in turn, could reduce health care and criminal justice system costs. Several information gaps about the implementation, associated challenges, and effectiveness of corrections-based MNT exist. While there have been studies of the administration of food and nutrition services, few discuss the interface with clinical services or the experiences in other developed nations besides the United States, United Kingdom, and Australia. 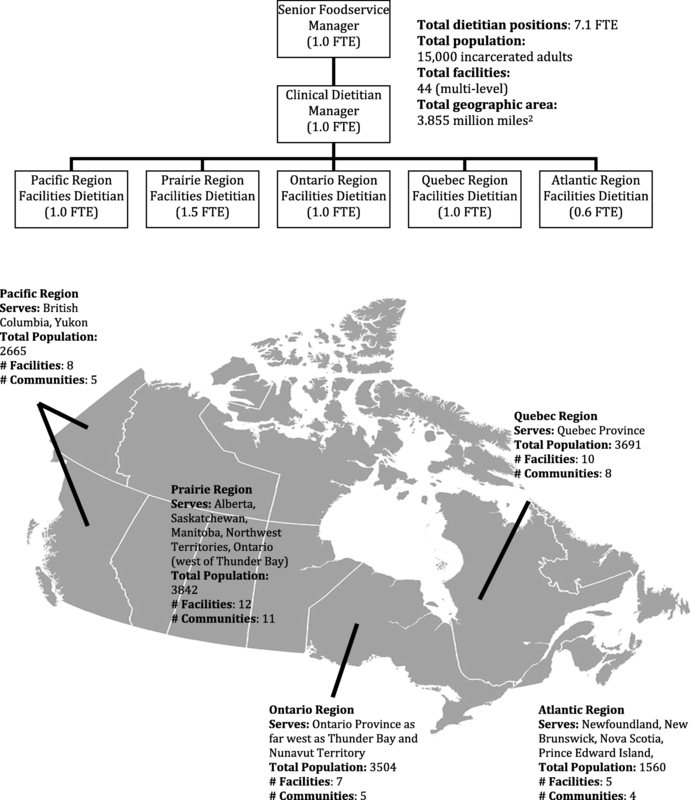 In particular, there is a paucity of research from Canada, which has unique correctional service features related to the dispersion and organization of nutrition services. Canadian-based data contributions that include examination of the interconnections between administrative and clinical food and nutrition services could serve to inform global discussions about nutritional status and incarceration. Furthermore, studies aimed at providing information about how healthy environments in Canadian correctional facilities can be created have been identified as a research priority for prison health . In Canada, an ethnographic study that focused on food insecurity and incarceration was undertaken. This investigation included naturalistic observation-based field notes about food provision and nutrition services in correctional facilities. In addition, the study included in-depth individual and focus interview data from individuals who were currently or formerly incarcerated and stakeholders involved in corrections and societal reintegration services. The availability of this detailed data provides a rare opportunity to examine the delivery of MNT in Canadian correctional facilities from the perspectives of multiple stakeholders. This study was a secondary analysis of data from a qualitative study that focused on food and nutrition systems in federal level correctional facilities (i.e., houses offenders serving a sentence of ≥ 2 years) and barriers/facilitators of food security experienced by incarcerated individuals . The study location was in the Fraser Valley region of British Columbia and the data was derived from 24 months of ethnographic fieldwork, including in-depth interviews from various stakeholders. In Canada, there are more than 14,500 adults in custody in federal institutions and more than 8000 supervised by Correctional Service Canada (CSC) in the community . Relative to the Canadian population distribution, a higher proportion of individuals less than 35 years of age (> 50%) and that are Aboriginal (25%) are admitted to sentenced custody [25, 26]. The health and social characteristics of those in custody have been described as having histories of childhood traumas, low socioeconomic status, Diagnostic and Statistical Manual of Mental Disorders diagnoses (i.e., substance use disorders, antisocial personality, affective disorders, schizophrenia, cognitive impairment, eating disorders), communicable diseases (e.g., tuberculosis, hepatitis C, HIV, sexually transmitted infections) and chronic conditions (e.g., cardiovascular disease, diabetes, asthma and other respiratory diseases, epilepsy) [14, 27–30]. While recent data about health service use prior to incarceration is lacking, prescription medication use during incarceration is high, particularly for psychotropic medications . Furthermore, mortality rates, generally due to homicide or suicide, for persons in custody exceed that of the general Canadian population [14, 31]. Thus, it is evident, that Canadians in correctional facilities face multiple health and social challenges, however, appropriate health interventions while in custody could provide the opportunity to initiate health behavior changes that would lead to important societal benefits. Documents about incarceration and reintegration (e.g., policies, legislation) were reviewed. Two researchers (one dietitian/researcher and one social worker/researcher) conducted naturalistic observation  over 16 months at the sites of two community agencies that provide services to current and formerly incarcerated individuals and during site visits to federal correctional facilities. 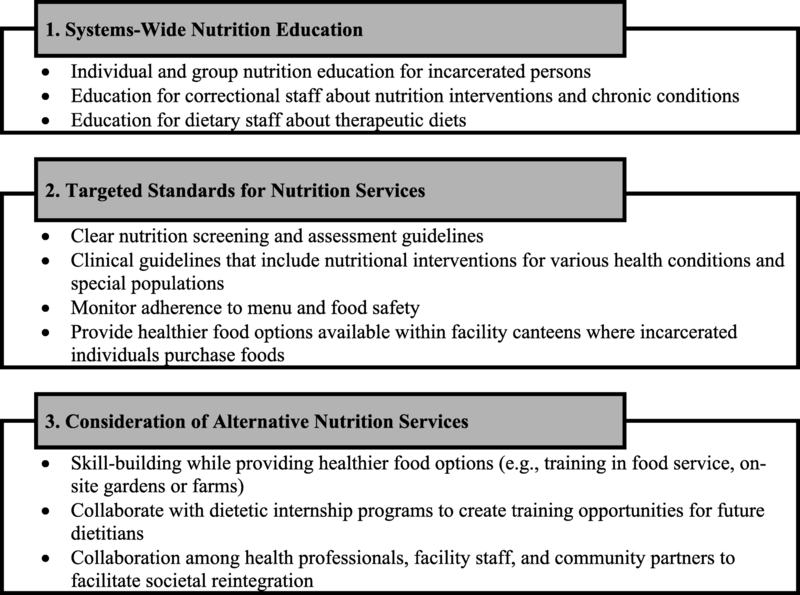 Purposive and theoretical sampling was used to gather in-depth interview data about food provision practices and incarceration from a diversity of participants (n = 63; Table 1) including nutrition practitioners (registered dietitians) who were working in a federal correctional facility or had worked in these settings (n = 6). All study participants provided written informed consent prior to individual and focus group interviews. With permission, interviews were audio-taped and transcribed. All aspects of the research received ethics approval by the Behavioral Ethics Review Board at the University of British Columbia (reference number H12–02095). The interview guides used for stakeholders and those with lived experience of incarceration are located in Additional file 1. Secondary data analysis provides an efficient way to re-examine previously collected information to generate new insights and knowledge . Ethical questions have been raised about the distance between secondary researchers and primary data when the researchers have not been involved in data collection . However, in this study the same researchers analyzed the data from both the first and second investigation. Furthermore, the data collected from naturalistic observations provided context to better comprehend stakeholder perspectives . A scoping review  was conducted by two research team members (KD, CD’A) to examine existing literature (1995 to present) about corrections-based MNT in developed countries. The review included keyword searches (i.e., diet*, nutr*, food, incarc*, jail, pris*) of various databases: Medline, PsycINFO, Embase, Social Sciences Abstracts, Sociological Abstracts, CINAHL, Criminal Justice Abstracts, ERIC, Proquest Criminal Justice, Proquest Dissertations and Theses, Web of Science, and Scopus. In addition, non-indexed sources were searched that included the Journal of Foodservice and The Journal of Foodservice Management and Education and reference lists of included studies and relevant reviews were scanned. The websites of relevant organizations such as Correctional Service of Canada, the Office of the Correctional Investigator, The John Howard Society of Canada, and the Canadian Association of Elizabeth Fry Societies were also reviewed. Any documents that directly or indirectly discussed MNT in correctional facilities (e.g., programs, services, recommendations) were included. Interpretive approaches [35, 36] grounded in a systems view were applied. The underlying assumptions were that nutrition services are an ‘intervention’ within systems and in-depth exploration of these services will create opportunities to enable capacity building . MNT was conceptualized as a process of interlinked components that included individual experiences, service implementation, health and social services contexts, the corrections environment, and societal reintegration. Using all of the original uncoded field notes and transcripts, manual thematic analysis was done by two research team members (KD and CD’A) to produce insights into MNT processes and their inter-relationships within the correctional system’s environment. To help ensure rigor, stakeholder and scoping review data were compared for consistency and thematic results were reviewed by dietitians and staff (e.g., food service employees, health professionals) with correctional experience and formerly incarcerated individuals to verify that the accounts were representative and comprehensive . The standards for health care in Canadian federal correctional facilities are outlined in the Corrections and Conditional Release Act . In Canadian federal corrections, the policy direction for the delivery of food services is the responsibility of the Assistant Commissioner, Corporate Services. The Assistant Warden, Management Services provides general direction for the delivery of food services. The Food Services Chief directly coordinates and manages all food services activities  with the assistance of registered dietitians. At the time of the study, CSC employed eight registered dietitians with a workload of 7.1 full time equivalents (Fig. 1). Approximately 15,000 incarcerated adults (~ 2150 incarcerated individuals per one FTE dietitian) rely on CSC for their nutrition care and daily food. The dietitians, assigned by region, are part of interdisciplinary teams that include physicians, nurses (~ 700), psychologists and assistant psychologists (~ 300), pharmacists, and social workers . While the ratio of dietitians to incarcerated individuals may appear to be favorable, unlike other countries such as the US (~ 13,800 incarcerated individuals per one FTE dietitian) , Canadian federal corrections facilities do not employ nutrition and dietetic technicians that work collaboratively with dietitians . The searches yielded 241 resources. Of these, 49 were included that either directly or indirectly discussed corrections-based MNT (1996 to 2017): two were from Canada [44, 45], 30 from the United States [46–75], and 16 from other developed nations, primarily the United Kingdom and Australia [7, 9, 11, 20, 21, 76–87]. Thematic analysis of the screened resources highlighted three broad areas where corrections-based MNT could be more effective (Fig. 2): 1) systems-wide nutrition education; 2) targeted standards for nutrition services; and 3) consideration of alternative nutrition services models. Further details and examples from these screen documents are integrated in the thematic analysis results. Most of the individual and focus group interview data provided direct or indirect information and perspectives related to corrections-based food and nutrition services. Stakeholder interview data primarily included perspectives about these services from health and food services staff (n = 6), incarcerated individuals (n = 7) and their family members (n = 3), and persons whose work focused on societal reintegration (n = 9) (e.g., employees of transitional houses and community agencies, parole officers). From the analysis three themes emerged: 1) specialized service provision in a unique environment; 2) challenges with MNT provision; and 3) consideration of corrections-based MNT alternatives. Theme 1: Specialized Service Provision in a Unique Environment. “As far as food..for many it’s all they got.” (Stakeholder Incarceration; SI#1). Most tended to discuss the quality of food and overall food environment. Individual nutrition counseling was the main area where direct MNT services were provided. The most frequent topics were type 2 diabetes and weight management which is common in this population  and are part of core competencies of entry-level dietitians. However, there are a variety of health issues such as hepatitis C, HIV/AIDS, tuberculosis, cardiovascular disease, mental health conditions, long-term neurological conditions, renal disease, substance use, complex behaviors, and historical trauma [79, 80] that are common. In addition, overrepresentation of population characteristics such as poverty, unemployment, and Aboriginal ethnicity may require higher level practitioner competencies [88, 89]. Contributing to the issues of burnout were the expectations to meet the diverse needs of incarcerated individuals in the many different facilities within a region. As voiced by one interviewee, you essentially “hit the ground running” and learn as you go. Theme 2: Challenges with MNT Provision. In conjunction with overall health service access issues, delays in access to MNT occurred due to factors such as clinic space constraints. Although on-site health clinics are available, appointments for nutrition counseling, even if requested by an incarcerated person, required a referral by a nurse or physician. Furthermore, if on a given day there was a surplus of health providers in the clinic, MNT would be cancelled in order to provide space. “… we had just one female prison and I only went there once in the whole time [7 years].” (RD#2). “You’re telling me there is someone who looks after diet stuff? I never saw or heard anything about this..” (Incarcerated Individual; from Field Notes Document #10; FN#10). Some incarcerated individuals self-managed their nutrition care by selecting or preparing specific foods at mealtimes. One individual described how he supplemented his diet with various natural health products “to feel vital and healthy.” (FN#16). Theme 3: Consideration of Corrections-Based MNT Alternatives. To place the thematic analysis in a broader context, a conceptual framework was developed to integrate the study’s findings with the pathways that lead to individual nutritional status (Fig. 3). 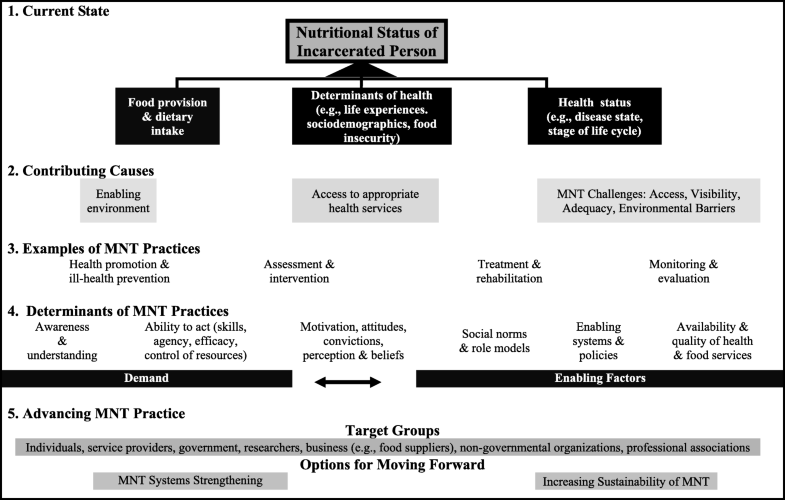 Based on this framework and study findings, an incarcerated individual’s nutritional status depends upon an interplay of immediate factors that include dietary intake, the determinants of health, and health status (e.g., disease state, life stage) as well as underlying influences such as the environment and access to health services (Levels 1 and 2). In Level 2 of the model, MNT and its associated challenges of access, visibility, adequacy, and environmental barriers (Theme 2) are highlighted. Level 3 outlines examples of nutrition care practices; their success is subsequently impacted by: 1) demand for services which is dependent on awareness, motivation to act, and ability to act; and 2) enabling factors that include social norms and support, systems and policies, availability and quality of food, as well as health and support services (Level 4). The other parts of the framework shift to strategies that could help advance MNT delivery. Target groups and practice components that are identified in the model are described in the following. Both the literature and stakeholder interview data highlighted how food choices are multi-factorial, even in correctional contexts . Different studies discuss that there is disconnect between what is specified on facility menus and the food that is consumed [11, 80]. This suggests that multiple stakeholders (e.g., facility and community-based, incarcerated individuals) need to be engaged to help implement appropriate strategies that target the multiple determinants of eating. For example, initiatives that are aimed at creating supportive food environments (e.g., improvements in food buy-up schemes, nutritional labeling on menus) and optimizing health and behavior (e.g., nutrition supplement studies in correctional facilities) have been implemented [11, 48, 80, 81]. In developed nations, there are many examples of food and nutrition skill building interventions in correctional facilities. Approaches such as training farms that build food literacy and skills of incarcerated individuals have been shown to substantially reduce food costs and improve employment potential of incarcerated individuals . In some instances, the farms and gardens are located within the community and provide food for residents which aligns with the goals of restorative justice . Examples from the Danish prison system illustrate how culinary education from chefs and self-sufficiency training enabled incarcerated individuals to shop and cook for themselves [82, 91]. Health promotion and wellness programs that are collaborative, use participatory and peer modeling approaches, and help build employment skills also help to optimize nutrition services as well as health and social outcomes [48, 82, 92]. For example, positive parenting programs that include healthy lifestyle interventions have led to returns on investment in excess of 6% through reduced use of various services including criminal justice . Integrating different delivery alternatives would also enhance the sustainability of corrections-based MNT. Service delays could be reduced by using telehealth . Interdisciplinary care conferencing, group education, and medical appointments could also create efficiencies [60, 95]. Collaborations between corrections and agencies that focus on societal reintegration would establish appropriate supports for ongoing nutrition care after incarceration. For example, a program that helped pregnant mothers who used substances prepare for nutrition care needs post-release improved their health outcomes . Finally, it must be recognized that future corrections-based MNT is dependent on preparing practitioners for this type of practice. Given that in some countries the vacancy rate of dietitians is approximately 40%, critical review of barriers impeding the pursuit of corrections-based employment is needed . As a starting point, utilizing successful models from other correctional settings to address dietitian skills training should be considered. For example, in Australia a service-learning model was adopted that partners government (prisons) and dietetic training programs that is sustainable and mutually beneficial . Dietitians in-training work with nutrition professionals in federal prisons and in turn, the facilities receive students able to take part in hands-on delivery of clinical nutrition services. Over a 3 year trial period, the work of the students was equivalent to one full-time dietitian position . Interprofessional training opportunities that enable learning with, from, and about others in corrections would help prepare nutrition professionals to be successful collaborators . In addition, developing knowledge and skills in cultural competency [96, 97], trauma-informed care , harm reduction [99, 100], and equity-oriented care  are critical to working effectively in a corrections-based environment. While this has been the first study to provide in-depth exploration of MNT in Canadian correctional facilities, the investigative limitations must be noted. The process of bracketing (i.e., self-reflective process of recognizing and setting aside a priori knowledge and assumptions) employed in the original study was not applied in the secondary analysis of the data . However, to minimize skewness in the reporting of results, all forms of data from the study were included and integrated with data from a broad scoping review. Selection bias was another limitation as the stakeholders were sampled based on their knowledge and experiences about food insecurity related to incarceration. However, conversations about food insecurity relied heavily on reflections about food and nutrition services in the corrections system and as part of the original sampling frame corrections-based food, nutrition, and health personnel were purposely selected. The individuals with experiences of incarceration who were interviewed may have been more health literate and may not have discussed issues that others face. The study was primarily conducted within one region of Canada and the results may not be generalizable to all provinces, territories, and incarcerated individuals. For example, few young individuals (e.g., < 18 years) and older adults were sampled. Further work in other regions, examining utilization data, and exploring experiences among more diverse groups would help to verify these findings. Having access to health care services such as MNT while incarcerated and during reintegration, along with other factors, can help lead to various societal benefits including reduced health care and social costs [103–109]. This secondary analysis of qualitative data helped shape an understanding about the delivery of corrections-based MNT in Canada. While there are many challenges associated with this type of work, there are also opportunities to better prepare incarcerated individuals for successful societal reintegration and reduce barriers that can contribute to marginalization and crime . Professional associations, government, researchers and other stakeholders can all help to strengthen corrections-based MNT by creating shifts in thinking about the role of MNT in these contexts, preparing future practitioners with the specialized skills needed to work in these environments, generating evidence that can best inform practice, and fostering collaborations that can lead to successes in societal reintegration. Karen M. Davison and Carla D’Andreamatteo contributed equally to this work. We would like to acknowledge the expertise and collaboration provided by the community partners that included Sherry-Edmunds Flett, executive director of L.I.N.C. Society, Greg Elford, pastor at New Heights Church located at Hope Central, and Carrie Prentice, Hope Central program coordinator. We would also like to acknowledge the staff and volunteers of the community partners whose work facilitated this collaboration. We deeply appreciate the participants that shared their experiences that informed this study and the peer research assistants who helped with recruitment and interpretation of textual data. We thank the research team members Sabina Markham, Clifford Holloway, Annette Browne, and Gillian Marshall for their insights during this project. We thank the Correctional Services Canada staff that enabled site visits and shared their insights which helped us to better understand the contextual factors related to this study. Finally, we thank the reviewers of this manuscript for the insightful comments that strengthened its content. This study was supported by funds from the Canadian Dietetic Foundation for Dietetic Research (grant# 232021–2500), Community First: Impacts of Community Engagement (CFICE) project, and a postdoctoral fellowship (Dr. Davison) from Intersections of Mental Health Perspectives in Addictions Research Training (IMPART) program funded by the Canadian Institutes of Health Research, Strategic Training Initiative in Health Research. The funding agencies had no role in the design, analysis or writing of the manuscript. Data supporting the results reported in the article can be obtained from the corresponding author. KMD and VLS developed the proposal for grant funding and conceptualized the sub analysis of data for this investigation. KMD and VLS formulated and implemented the analysis plan. All team members were involved in data analysis. KMD and CD’A drafted the manuscript for feedback by research team members and did the revisions. All authors have read and approved the manuscript. All study participants provided written informed consent prior to individual and focus group interviews. With permission, interviews were audio-taped and transcribed. All aspects of the research received ethics approval by the Behavioral Ethics Review Board at the University of British Columbia (reference number H12–02095). World Health Organization. The double burden of malnutrition. http://www.who.int/nutrition/double-burden-malnutrition/infographic_print.pdf?ua=1. Updated 2018. Accessed 25 May 2018. Correctional Services Canada (CSC). Food Services - Central Feeding. http://www.csc-scc.gc.ca/politiques-et-lois/880-1-sop-eng.shtml. Updated June 30, 2007. Accessed 15 Aug 2017. Correctional Service Canada. Quick Facts: CSC statistics – key facts and figures. Available from: http://www.csc-scc.gc.ca/publications/005007-3024-eng.shtml. Updated June 2017. Accessed 25 May 2018. Perrault S. Admissions to adult correctional services in Canada, 2011/2012. Ottawa: Statistics Canada; 2014. Available from: https://www.statcan.gc.ca/pub/85-002-x/2014001/article/11918-eng.htm. Accessed 25 May 2018. Perrault S. Admissions to youth correctional services in Canada, 2011/2012. Ottawa: Statistics Canada; 2014. Available from: https://www.statcan.gc.ca/pub/85-002-x/2014001/article/11917-eng.htm. Accessed 25 May 2018. Beaudette J. Prevalence of mental health disorders among incoming federal offenders: Atlantic, Ontario, and Pacific regions. Ottawa: Correctional Service of Canada; 2013. Available from: http://www.csc-scc.gc.ca/research/005008-err13-3-eng.shtml. Accessed 25 May 2018. Stewart L, Wilton G, Cousineau C. Federally sentenced offenders with mental disorders: correctional outcomes and correctional response. Ottawa: Correctional Service of Canada; 2012. Available from: http://www.csc-scc.gc.ca/research/005008-0268-eng.shtml. Accessed 25 May 2018.
Corrections and Conditional Release Act. SC 1992 c 20. Available from: http://laws-lois.justice.gc.ca/eng/acts/C-44.6/FullText.html. Accessed 25 May 2018. Correctional Service Canada (CSC). Commissioner's Directive - Food Services. http://www.csc-scc.gc.ca/lois-et-reglements/880-cd-eng.shtml. Updated June 30, 2007. Accessed 15 Aug 2017. Correctional Service Canada (CSC). Health Service Staff. http://www.csc-scc.gc.ca/careers/003001-1300-eng.shtml. Updated June 23, 2013. Accessed 15 Aug 2017. Marcason W. Nutrition for Inmates. http://www.eatrightpro.org/resource/news-center/in-practice/dietetics-in-action/nutrition-for-inmates. Updated January 2, 2017. Accessed 15 Aug 2017. Academy of Nutrition and Dietetics. What is a Nutrition and Dietetic Technician Registered? https://www.nutritioned.org/rd-vs-dtr.html. Updated January 2, 2017. Accessed 15 Aug 2017. Federal Bureau of Prisons. Detoxification of Chemically Dependent Inmates - Federal Bureau of Prisons Clinical Practice Guidelines. 2014. Available from: https://www.bop.gov/resources/pdfs/detoxification.pdf. Accessed 9 Aug 2017. Federal Bureau of Prisons. Management of Diabetes - Federal Bureau of Prisons Clinical Practice Guidelines. 2012. https://www.bop.gov/resources/pdfs/diabetes.pdf. Accessed 9 Aug 2017. Federal Bureau of Prisons. Management of HIV Infection - Federal Bureau of Prisons Clinical Guidance. 2016. https://www.bop.gov/resources/pdfs/mgmt_hiv.pdf. Accessed 9 Aug 2017. Federal Bureau of Prisons. Management of Major Depressive Disorder - Federal Bureau of Prisons Clinical Practice Guidelines. 2015. https://www.bop.gov/resources/pdfs/depression.pdf. Accessed 9 Aug 2017. Federal Bureau of Prisons. Management of Tuberculosis - Federal Bureau of Prisons Clinical Practice Guidelines. 2012. https://www.bop.gov/resources/pdfs/tuberculosis.pdf. Accessed 9 Aug 2017. Flaherty J. The Prisoner’s nutrition dilemma. Medford: Tufts University; 2016. Available from: http://now.tufts.edu/articles/prisoners-nutrition-dilemma. Accessed 9 Aug 2017. Queensland Government, Queensland corrective services. Food and Nutrition Policy and Implementation Plan 2009. https://publications.qld.gov.au/dataset/c85d0cd0-a020-4390-b2a3-5090e480d9e6/resource/a76e0236-2c88-4a56-ac2b-3b2287625261/download/foodandnutritionpolicy.pdf. Accessed 9 Aug 2017. Long-term Inmates Now in Community (L.I.N.C.) Society. Emma's Acres: Reintegration, Restoration and Food Security. 2017. http://lincsociety.bc.ca/emmas-acres-reintegration-restoration-and-food-security. Accessed 15 Aug 2017. Correctional Services Canada. The Changing Face of Canada's Prisons: Correctional Investigator Reports on Ethno-Cultural Diversity in Corrections. 2014. http://www.oci-bec.gc.ca/cnt/comm/press/press20131126-eng.aspx. Accessed 9 Aug 2017. Wikimedia Commons. File: Canada blank map.svg. 03-07-2007 edited 8-Aug-2007. Available from: https://commons.wikimedia.org/wiki/File:Canada_blank_map.svg. Accessed 25 May 2018.